So, what’s a reverse rainbow? Let me explain. I grew up in the Central Appalachians, where summer showers generally pressed more or less easterly, and most commonly (as do convection-spirited showers everywhere) occurred in the afternoon and evening. The same holds true here in northern Alabama. Here’s the scenario. These heat-and-moisture-enabled pop-up showers often drop heavy rain and quickly move on, followed by rapidly clearing skies, allowing the now sinking-toward-the-western horizon bright sun to illuminate the retreating rain shield. Presto, a rainbow. Not every time yet often enough that the colorful spectacle and its promise of good fortune is anything but rare… yet always a nice visual (and emotional) treat! 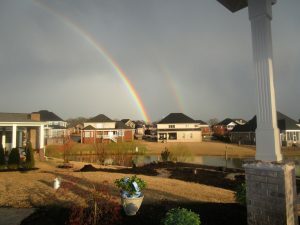 I viewed the rainbow as what came after the rain. Such was the case with this spring 2016 rainbow; here’s the evening view looking east from my back patio toward a departing shower. Saturday evening (6:30 PM) July 7, 2018, I had just watched a thundershower pass east-to-west 3-4 miles south of us. Northern Alabama sat on the far south perimeter of a sprawling high pressure system over the eastern US. Its clockwise spin sweeping moist Atlantic Ocean air west across South Carolina, Tennessee, and Georgia, creating deep instability over us. I watched radar with disappointment as the shower missed us — we could use some rain more significant that the 0ne-tenth-inch I measured earlier in the day from two brief passing showers. As I sat watching, vertically bubbling cumulus began to build east of us, their cauliflower tops visibly reaching higher rapidly. Soon radar indicated a spot of red (a deep echo return indicating a shaft of heavy rain) beginning to spread 5-7 miles away. Conditions were triggering new development up-flow from us. My hopes rose. The sky began to darken and then evidence an approaching shower-cell with an emerging shelf cloud. Look closely. There in advance of the rain with the evening sun shining brightly on the homes along Big Blue Lake, a faint rainbow identifies the mists blowing down and forward of the main rain curtain. 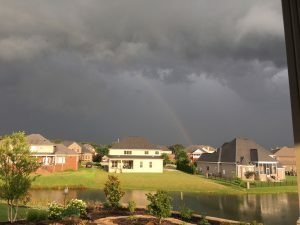 So, here’s the evening view looking east from my back patio toward an approaching shower — along with its reverse rainbow! By this time (below) the deep booming and growling from cloud-to-ground early stage lightning sounded within four miles… and closing. We could hear the wind as the shelf cloud bore toward us. Gusts hit us with sprays of mist within just a few seconds of this photo. Because we scrambled to secure patio furniture cushions indoors, I missed snapping a photo of the first large drops hitting the lake surface with the sun still shining. Only as the downpour began did the darkness from 30-50,000 feet of thunderstorm above us bring the very special light-show to an end. Just the day prior I watched a solid line of mature storms march our way and generate an outflow boundary that sparked a new line beyond us, in effect skipping over us with nary a drop of rain. This one blew up just upstream and then gave us its best shot of rain and lightning. Rarely do our storms move from east to west — this one surprised me with its movement. I don’t recall another time when I saw a rainbow lead the charge — conditions proved serendipitous — similar to eating dessert before the main course! I often see people lost in digital devices. My only digital distraction for this July thunderstorm — the iPhone-accessible radar that informed and amplified my observations and gleanings. I can’t imagine a video game or TV program more senses-rich than watching and learning from Nature. I could not possibly have estimated the value I registered in experiencing the development, approach, and passing of such a simple act of power and fury. An act of controlled violence… controlled by the immutable laws of atmospheric physics. Ours is a planet of turbulence… turbulence whose sole purpose is to achieve balance and equilibrium. The old truth applies: Every action has an equal and opposite reaction. I appreciate the lessons embedded in Nature’s forces and mechanisms. Knowing the science underlying the violence amplifies my embrace of the resultant beauty, magic, wonder, and awe. I view that accentuation as akin to how knowing music increases the aesthetic gift from a symphony; how understanding the act of painting enhances our awe of a work of art. Nature teaches that even the most tumultuous summer thunderstorm evolves according to knowable laws, forces, and actions. Understandable even if not precisely predictable. If only the same were true of the chaos and turbulence in Washington D.C. Passion, emotion, and self-preservation dominate that field of play. Similar to the storm I enjoyed, so much in our nation’s capital creates gust fronts… gusts of sanctimonious bloviation. Ah, if only I could comprehend politics and view it with appreciation, awe, and inspiration. I suppose there are those who understand politics as well as I do Nature. And those who enjoy politics as much as I do natural phenomenon. I choose to stick with Nature. Perhaps I will more conscientiously contemplate whether and how Nature’s lessons for living, learning, serving, and leading might apply to politics. I am sure they do yet I am unwilling at the moment to penetrate that morass. I will conclude this Post with deep appreciation for the purpose and natural laws that govern life and living on this Earth. A thunderstorm is Nature’s atmospheric venting… a pressure relief valve. How will Nature relieve the pressures associated with a burgeoning human population and the consequences of the cumulative demands we place upon our One Earth? The storm I witnessed rose to vent an explosive point (time and place) of atmospheric instability. How will Earth and natural systems seek and secure life system stability as we continue to expand our call upon resources of soil, water, and air? The Earth system will secure balance and stability, perhaps at our species’ peril. I hope we as a species can find our own way to secure balance and stability. Judy and I worry about our five grandchildren and the multiple burdens we are placing on their shoulders. I remind you that I am a weather addict, hooked on its captivating nuances, predictable (and not so predictable) patterns, and heart-stopping power and beauty. I witnessed one of Nature’s most powerful land-based weather phenomena last week — a derecho. 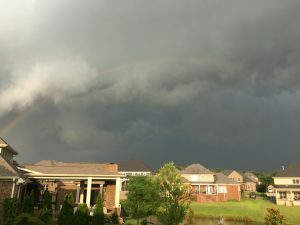 Derechos are often referred to as inland hurricanes due to the hurricane-like conditions, in terms of ferocious wind and torrential rain, which are spawned by this weather phenomenon. 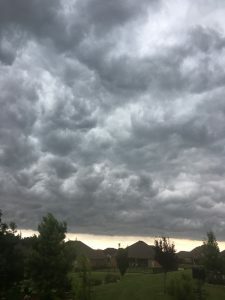 This term refers to a dangerous type of thunderstorm complex that travels along a path of at least 240 miles, according to the Storm Prediction Center. These violent severe thunderstorm clusters produce widespread and long-lived, straight-line wind damage. June 28, 2018 late morning I watched high clouds begin to sag from the north. I checked the radar to see a thickening line of thunderstorms building and dropping from northeastern Tennessee. The high clouds proved to be the anvil ahead of the derecho. Our local forecast soon included a severe thunderstorm watch, followed by a warning. The derecho approached at 30+ miles per hour. Its gust front and preceding shelf cloud brought 12:30 PM near-darkness to us. This photo captures the turbulent underside of that front, extending for tens of miles, racing south well ahead of the rain shield. This view is nearly vertical from my Madison, Alabama driveway. By now the wind howled and thunder boomed less than five miles away. I raced to our south-facing lawn looking over Big Blue Lake. A fearsome image. I thought the four horsemen of the apocalypse might appear at any moment. Or Willie Nelson’s Ghost Riders in the Sky! Are the Hounds of Hell baying within that violent firmament! The menacing roiling, massive underside hinted at Armageddon. I admit to some level of deep apprehension and fear. 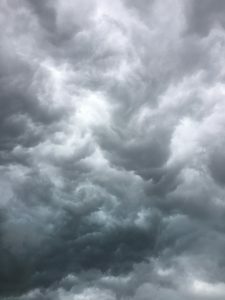 As a student of Nature and weather, I knew and appreciated with certainty what I was witnessing yet something hard-wired within me evoked an involuntary fear/flight reaction, one that may have served a survival purpose. As the lightning grew closer I retreated indoors to window-watch. 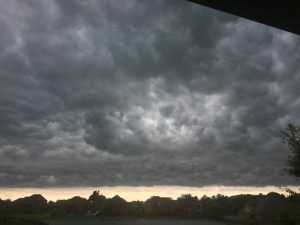 As the rain hit and continued I snapped a photo to the south, the ugly prefatory sky, strong winds, and initial deluge long since given way to a moderate rain. I measured 1.3 inches of welcome rain, bringing the June total to 5.15 Inches. The derecho reached the Gulf coast by evening, far exceeding the Storm Prediction Center’s minimum path of 240 miles for derecho designation. The next morning, 65,000 Alabamians remained without power. I saw a few small branches and a handful of downed trees as I drove into town. By and large we escaped the full fury in this vicinity. I characterize this derecho as still another episode of Pleasurable Terror for me. We inhabit a dynamic planet… whether a north-Alabama derecho or Hawaii’s Kilauea volcano. That dynamism over the vast sweep of time has shaped the Earth and its living systems that sustain us. This is our Garden of Eden. The turbulent, occasionally menacing, and sometimes devastating forces at play are part of the bargain in living on Planet Earth. In fact, such is the case for every life and enterprise within this wonderful experiment we call humanity. Into each life a little rain must fall. Our burden is to understand these forces of Nature and human nature. We are best served when we know what we face and deal with circumstances accordingly. Nature-Inspired Learning and Leading demands that we pay attention and learn from Nature’s Lessons. Clouds portending fury certainly do not capture my sole (or soul) attention. Two evenings before the derecho, a thunderstorm dying to the WSW caught my eye (lower left). The next morning, a delightfully pleasant sunrise sky suggested that all would be well for the day ahead (lower right). I am a hopeless weather junkie — addicted for life! I’ve included essays recounting personal episodes with Nature’s pleasurable terror in both Nature Based Leadership and Nature-Inspired Learning and Leading. A meteorologist friend in New Hampshire declared us weather perverts — we both thrill at weather that is harsh and threatening. For example, we believe that nothing beats a strong winter Nor’easter. The more snow and wind the merrier. One of my most memorable life-days was the Storm of The Century, The Blizzard of 1993, when we lived in State College, Pennsylvania. March 13 brought 28 inches of new snow and winds gusting to 65 miles per hour, along with thunder and lightning. I stayed nose-pressed-to-the-windows for hours, venturing out once in a while to shovel and soak up the storm via all five portals: body, heart, mind, soul, and spirit. A sensory feast beyond compare! The second of many special memorable moments came during a winter summit attempt on New Hampshire’s Mount Washington in February 2015. We made it to 5,300-feet before nearly hurricane force winds, temperatures well below zero, and ten-foot drifts forced us to abort. The permanently-staffed station at the summit observatory (6,288-feet) registered winds in excess of 100 with ambient air temperature at 20 below. And we were guests of the Observatory ascending in an Arctic Cat! My life is rich with tales of pleasurable terror. This past Friday in an air mass of deep tropical moisture from the Gulf, several thundershowers passed during the day. This one strengthened rapidly as it approached and built over us. Later I watched it blossom on radar, hitting us with intense rain and strong wind. It peaked impressively during this 22-second video recording on my iPhone. I will never tire of Nature’s Pleasurable Terror, although this one came close to a threshold of concern. Great entertainment! May Nature inspire all that you do! Her beauty, magic, wonder, and awe are available for those who seek Nature’s dividends. 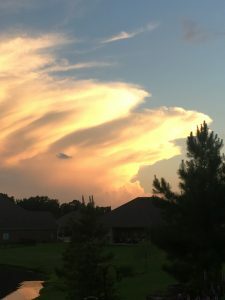 Thunderstorms in such air masses are Nature’s venting mechanisms, release valves for the tremendous energy generated by summer’s southern sun and a moisture-rich unstable atmosphere. We all have our own coping and venting mechanisms. I bike, lift weights (yeah, at age 67 they are light weights! ), hike, and stay busily engaged in living. I did same during my four university presidencies. We all need to let off steam under conditions that, to the extent possible, we control. Nature copes quite well normally, releasing pressures and seeking balance harmlessly and routinely. But not always. Once in a while she throws a hand-grenade — Mount Saint Helens; the Alaska Good Friday Earthquake; the Storm of the Century; Sandy; Katrina; and other epic events. Last Friday’s squall amounted to a minor venting, reaching near-damaging wind yet bringing down only a few twigs and leaves. We deal commonly with minor venting in our life and enterprise. Like Friday’s storm, most such minor life perturbations are predictable and somewhat routine. It’s only when the wind rises that coping exceeds a threshold, requiring cleanup, rebuilding, and recovery. Nature teaches that venting is a fact of life; that preparation and anticipation are essential; and that sometimes we are dealt more than we can easily handle. I thought as I watched the squall, what if I had heard the terrible fright train roar of an approaching tornado? Pleasurable terror would have shifted to the cold fear of absolute TERROR. Even then, because we built in a region where tornadoes are not rare, we have a tornado shelter. We would have taken shelter, and prayed for escape. We understand, measure, monitor, and video record orders of magnitude more closely than ever. We now number eight billion humans, subjecting more and more of us to harm’s way. We occupy coastal zones, riverine systems, tectonically active regions, and other areas subject to Nature’s ravage more than ever. We live in Nature’s cross-hairs, too often ignoring the risks we impose. We tempt fate by failing to recognize the peril we self-select. Will we ever learn? Can we become informed, responsible stewards of this One Earth? We have just this one chance to get it right. So far as we know, we are alone in the vast darkness of space. No one will be coming to rescue us from ourselves. A wee thundershower, a welcome deep-south summer diversion, serves as a vivid reminder of Nature’s ways. Ways that are both wondrous and terrifying; relentless and inescapable; gentle and all-powerful. Ways that are generally predictable; rules that are constant and immutable. Laws that we cannot breech but at our peril. Do your part to understand our place in the world… our role in assuring humanity’s future. We face a potential tsunami of unintended consequences. On so many human/environment fronts, we are pushing past a threshold of soft and benign venting. On a lighter note, learn first to enjoy Nature’s beauty, magic, wonder, and awe — whether in form of a brief summer tempest… or the rainbow that follows. Please consider this blog as an early summer interlude. A break from more serious Natural musings. The Huntsville Botanical Gardens (http://hsvbg.org/) is currently hosting a few Jurassic guests — animatronic dinosaurs (http://hsvbg.org/event/dinosaurs-uproar-alive/). 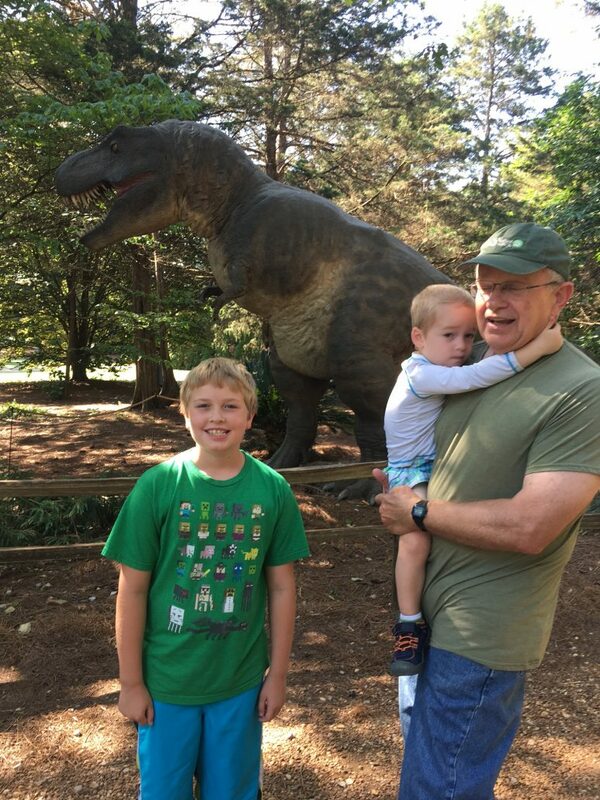 We visited Saturday with our two local grandsons, 9.5-year-old Jack and 3.25-year-old-Sam. As we walked into the gardens, Sam talked non-stop about how much he loved dinosaurs and expressed great anticipation in seeing them. Dread, fear, trepidation? Not a chance! He and big brother ran ahead toward the dinosaur exhibit section — until we began to hear faint grunts and roars from the wooded trails ahead. Sam and Jack stood still until we stragglers caught up with them. Sam then chose to walk between Judy and me, holding our index fingers. He’s a little too small yet to grasp an entire adult hand. Each step forward elevated the disturbing audible signals. Sam tightened his grip every few steps. The TRex soon became visible through the foliage. Finger/hand contact no longer contented and comforted Sam. He demanded that I hold him. Even Jack refused to walk to the display fences and rope cordons, saying with a clear look of consternation that he didn’t want his photo taken. Right! Even in my arms, Sam rebelled. Raw fear prevailed no matter the assurances that I gave him. These critters were extraordinarily life-like. Once we left that exhibit of nine dinosaurs (five adult; four young ones) and headed toward the outdoor model train area, Sam regained his composure. He once again chattered about how much he likes dinosaurs, and assured us that he had not been afraid. Would the boys have felt the same visceral reactions if not for having seen movies like Jurassic Park and Jurassic World? Is their fear and trepidation hard-wired? That is, unease (and terror) attributable to nurture or nature? For some reason, Jack still harbors an irrational (my assessment as a snake-lover) fear of snakes. Why? That same why applies to so much that occurs at the intersection of Nature and human nature. The cure? Exposure, education, understanding, appreciation, and embrace of Nature-inspired learning. And, harnessing Nature’s wisdom to living, learning, and serving. These Jurassic creatures ruled the world; lorded over all of Nature. Yet, one calamitous Earth-collision with a large object from space ended their reign. Their demise was not self-imposed. These small-brained reptiles thrived via brawn, not brain. We humans thrive by virtue of our brains. Yet, we seem resistant to applying and harnessing Nature’s wisdom to steward our Earth. I fear our human-species-Earth-collision may be self-generated and self-inflicted. What will it take to awaken and enlighten us? For Sam and Jack’s sake, I pray that we discover the way before we cross some critical threshold. I’m a lifelong weather enthusiast, catching the rain/wind/snow/sleet/hail/cloud bug in my earliest memories. The weather affliction deepened when I practiced forestry, which took me outside day after day. Outdoor-oriented avocation likewise immersed me in Nature. As a former, decades-long distance runner, I often braved (I considered it relished) what others consider adverse conditions. I pay attention to the weather — some might say I pay homage to it. You’ll see a weather theme often in my blogs. In part because I love it; also, because so many of Nature’s lessons can be illustrated through the vagaries and perturbations of weather… and their influence on our lives. Saturday May 20, 2017, provided a perfect demonstration of Nature’s wild side right here at our home. We had enjoyed a warm early summer morning, working in our perennial beds, building a field-stone wall, and just relaxing. We had gone two weeks without measurable rain. 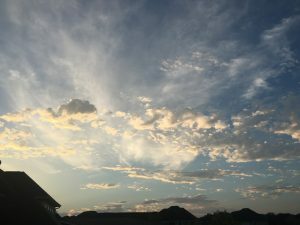 The prior weekend’s promised showers and storms failed to develop. 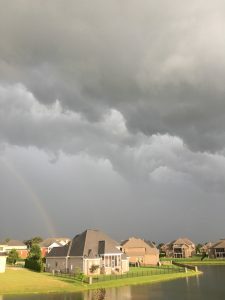 Mid afternoon this Saturday, a north-south cold front approaching from the west through Central Mississippi began to trigger a well-defined line of storms. My hopes for the rain strengthened. An hour later, a new thunderstorm cluster began developing east of the front equidistant from us as the front west of us. The front east-bound; the cluster north-bound. I watched all this transpire on Doppler radar. To my surprise and glee, the two coalesced over our vicinity. 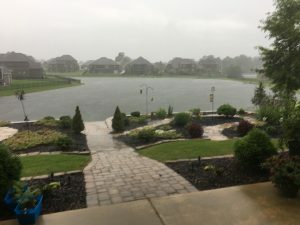 By now, the National Weather Service (NWS) posted a severe thunderstorm warning for gusty winds and frequent lightning. The sky darkened; thunder rumbled. I caught the initial surge on video as the storm rolled across Big Blue Lake. My first book, Nature Based Leadership, includes essays chronicling my own experiences with what I refer to as pleasurable terror! This storm’s wind, frequent lightning, and heavy rain, I suppose, would have terrified some. I viewed it as welcome rain and a great show. I admit, however, to being glad to be sheltered in the doorway. My true pleasurable terror tales involved me one-on-one with the elements outside. We have a tornado shelter, within which we have previously sought shelter when a more serious warning was issued. The NWS had made it clear all day that conditions were not right for generating tornadic cells. I felt little threat enjoying the display from the doorway leading out to our patio. My courage (some would suggest foolishness) derived from experience and knowledge. I judged the risk minimal. The return to my psyche far outweighed the downside. I would have paid good money to watch Nature’s beauty, awe, magic, and wonder at play… a show I viewed for free. Every decision in our lives and enterprises entails risk/benefit assessment. Without experience and knowledge the zone of uncertainty can be wide — the gray area broad. Go or no-go? The more we know, the narrower the band. Preparation is key. Dividends flow from measured risk. Investment promises greater, more reliable return when we understand, appreciate, and anticipate outcomes. Excess caution and foolhardy action can both yield disappointment and poor results. My decision May 20 enabled me to witness (and marginally experience) Nature’s power and beauty on the wild side. The movie has not yet been made that satisfies, inspires, or moves me as that afternoon’s amazing alignment of forces. I am grateful for every lesson that Nature teaches and inspires. Great Blue Heron strives to harness Nature’s wisdom in service to your life and enterprise!